Disclaimer: Each post is for informational purposes only. It is not a solicitation, a recommendation or advice to buy or sell any security or investment product. Information provided in each post does not constitute investment advice. 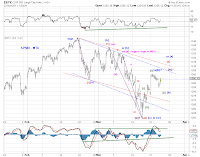 Across indexes, the market is finishing up an extended wave [iii] from the low based on the bullish count - totaling 7 or 11 waves depending if one counts the subwaves of wave [i]. 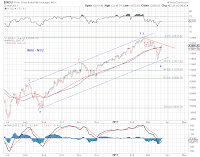 A wave [iv] pullback is due soon if not already in progress. 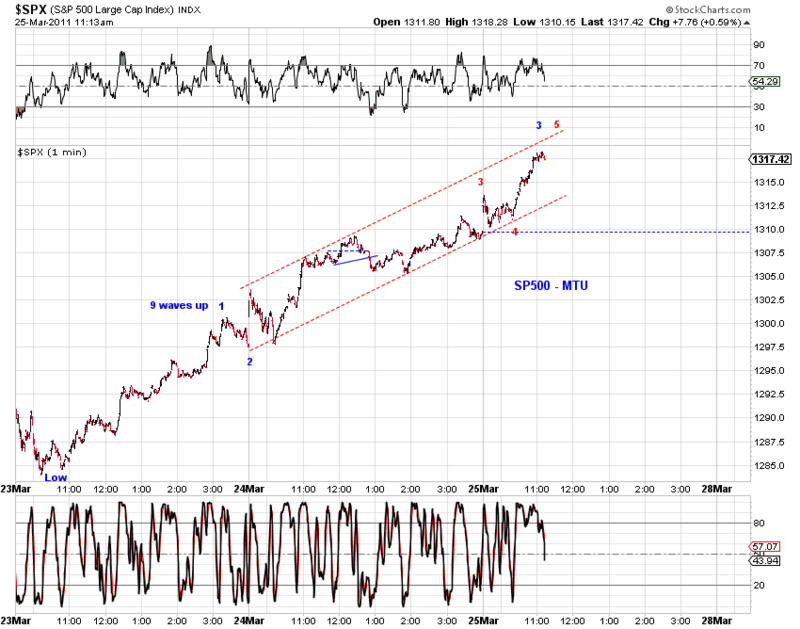 Note that 7 or 11 can also be the completion of a corrective wave. TRAN,MID,RUT have reclaimed their respective Feb highs. 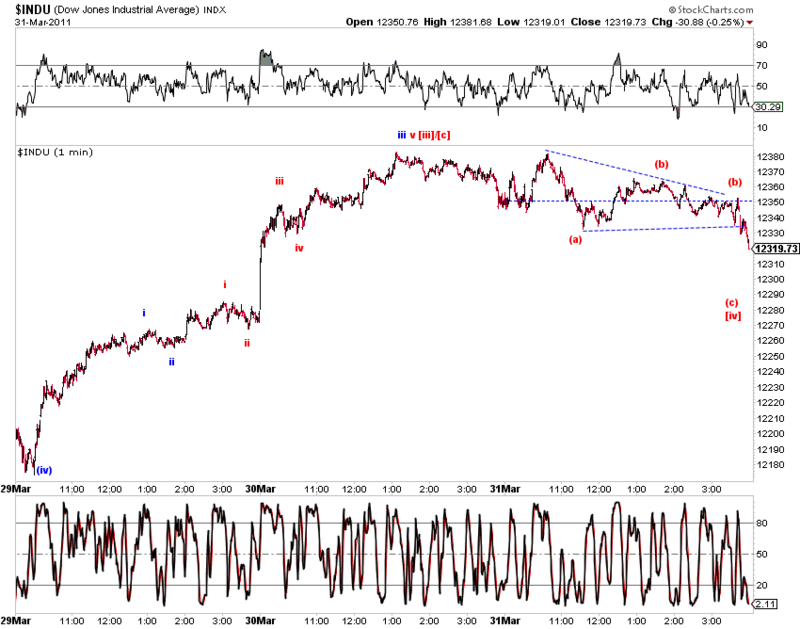 Please see the 2pm entry below for key observations regarding the near term count from the recent low. There's little to add to that. 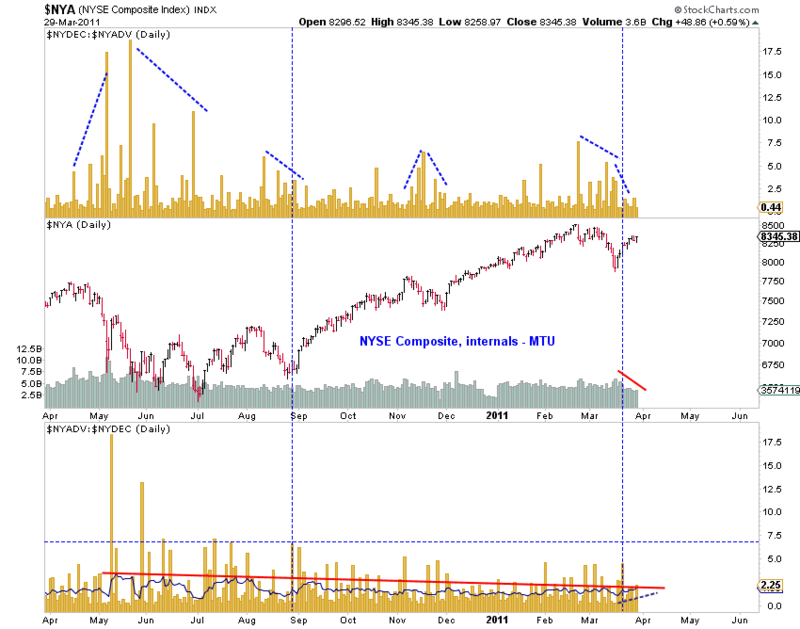 The rebound is still on low and declining volume, but breadth is slowing improving (Chart 1). 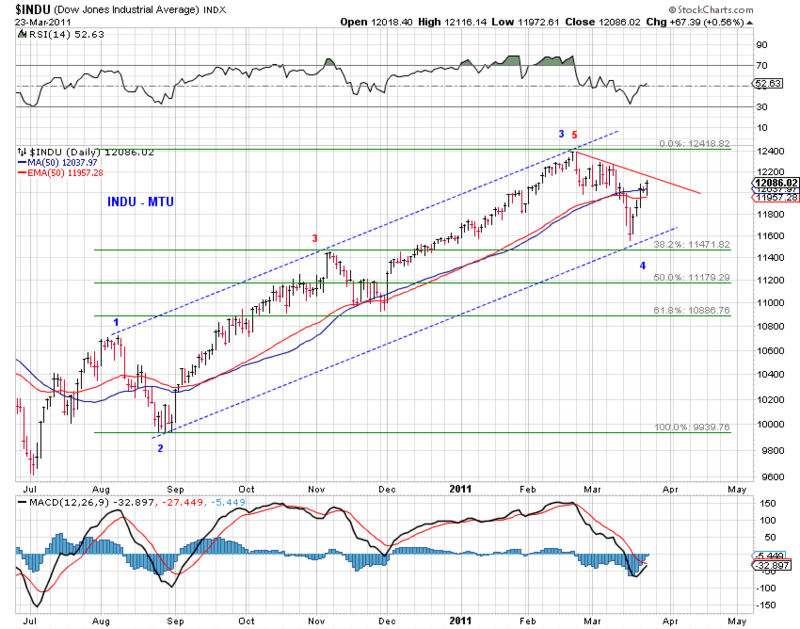 Technical damages on the daily chart continue to be repaired (Chart 2). 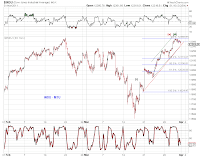 The market is working on the 11-th wave up from the recent low in senior indexes, which is open to both bullish (green) and bearish (blue and red) interpretations. 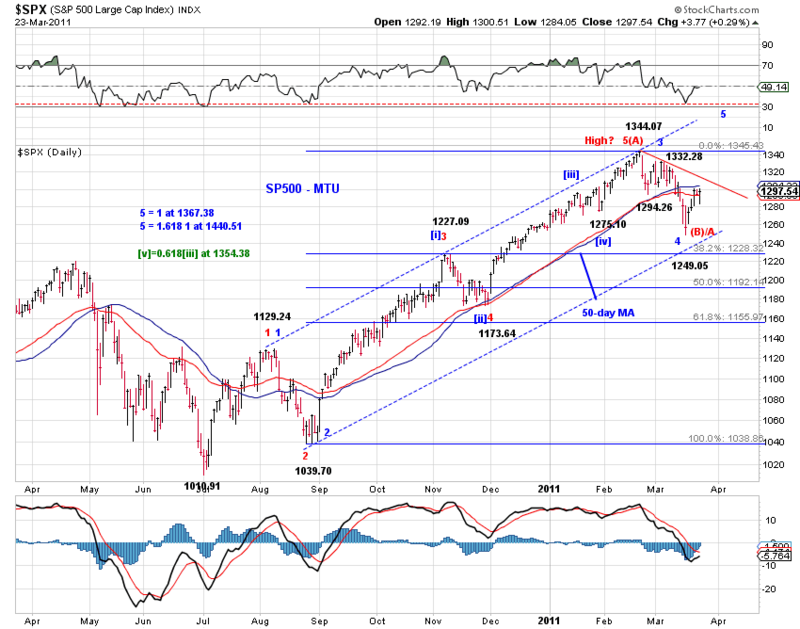 The red count shows one way to label the recent sell-off as a five - it does not carry across all indexes, but several of them. 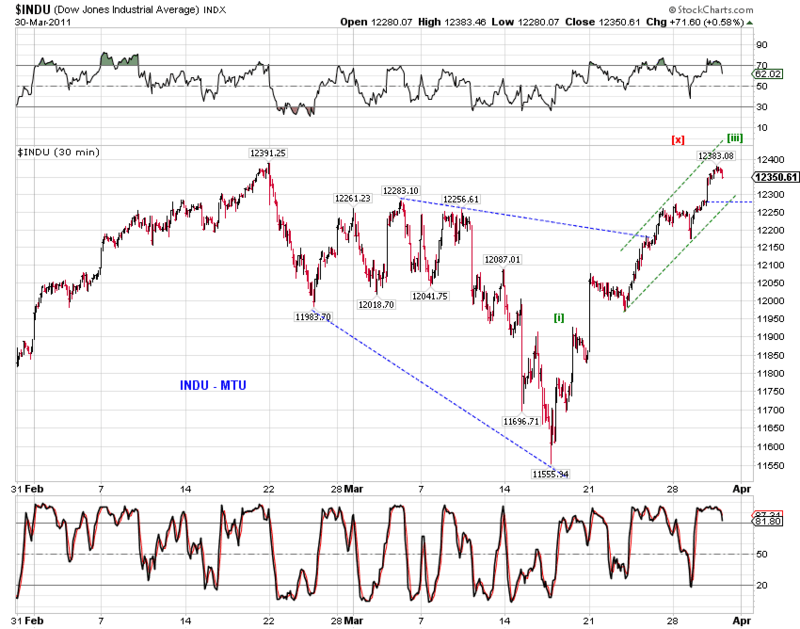 INDU is a bit more than 100 index points away from invalidating this extremely bearish potential. 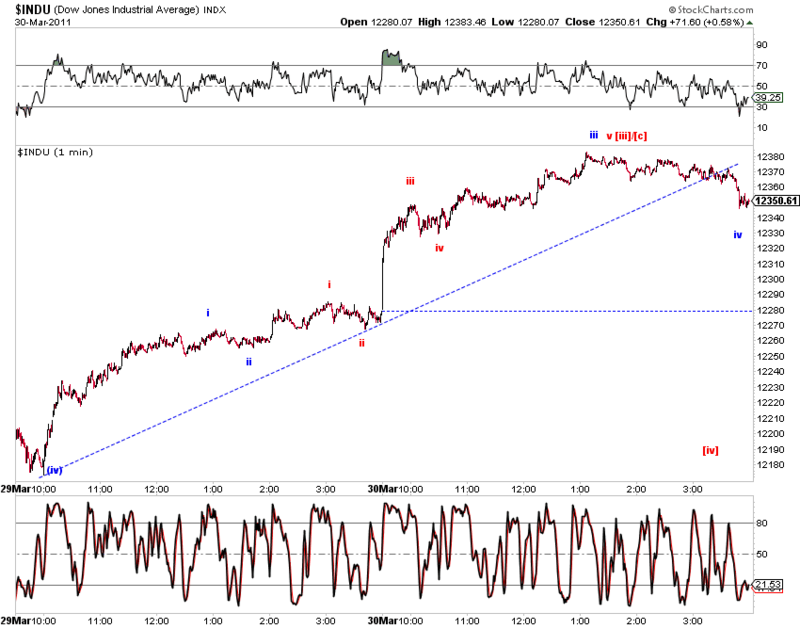 The green count on ES is based on a potential flat highlighted in the 1055am entry. 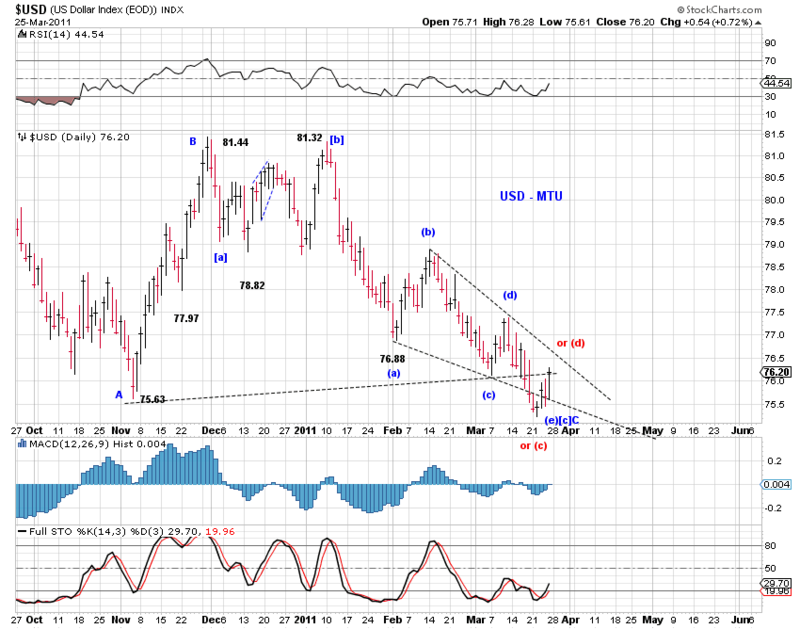 USD hits resistance for now. 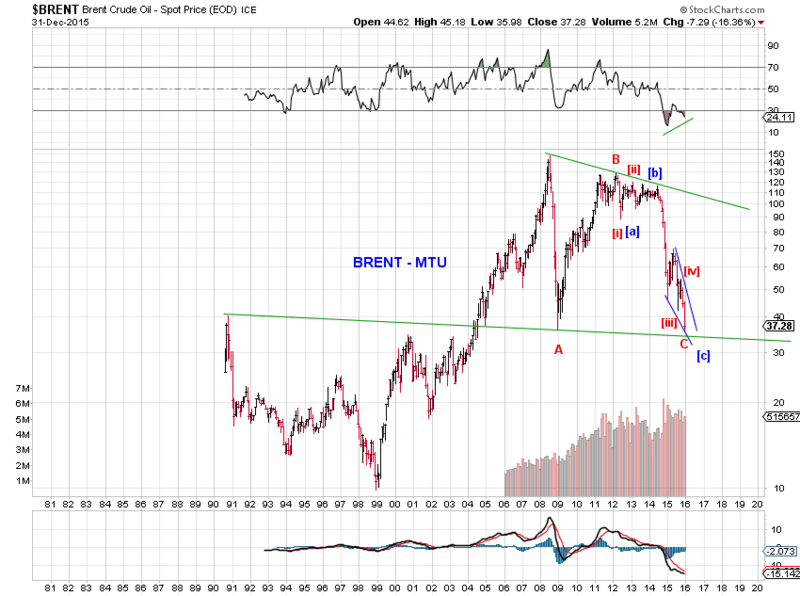 Please see The Larger Count (stocks and USD) (3/25/11) for discussions on the development in USD. 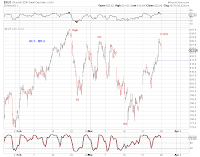 The key assessments in Path of least resistance/support (3/18/11) remain applicable (see the overview section), with the exception of fresh support levels brought about by a 2.7% follow-through rebound in SPX over the past week and a 5.61% recovery from its 1249.05 low. 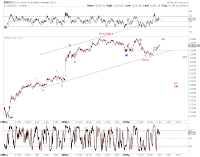 This piece updates support levels and near term wave counts, offers thoughts on the larger count and how recent market gyrations fit in, and highlights a potentially important development in the USD index. 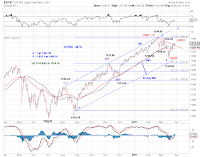 The stock market recovery from its recent lows has been repairing technical damages brought by the recent sell-off and building fresh support levels. At the moment, the immediate support zone in SPX is 1295-1305 which includes a break-out pivot, 50-day simple and exponential moving averages and a prior dynamic resistance now serving as a support. 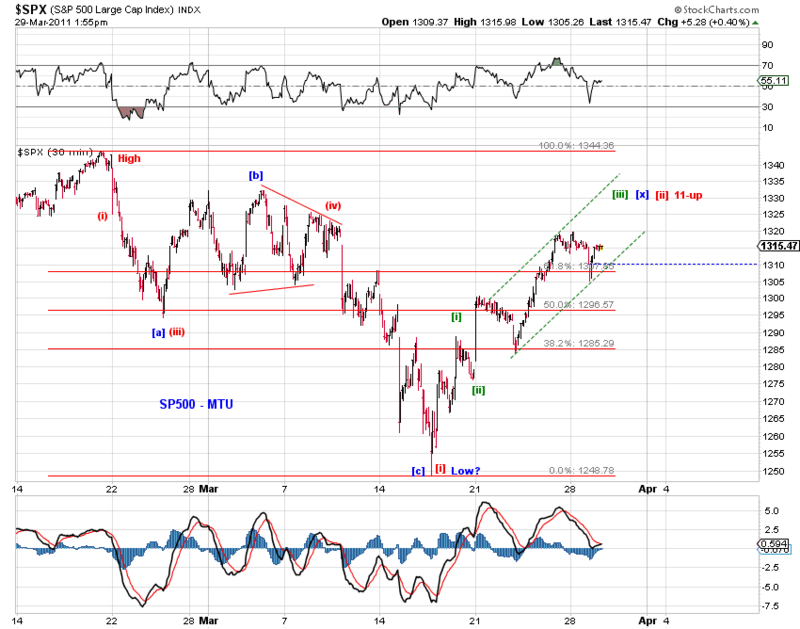 Lower support levels are around 1280, 1226 and 1194. 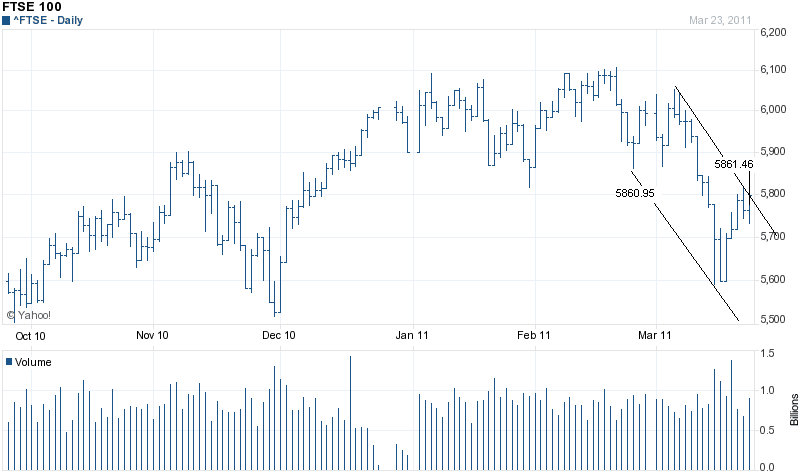 It remains to be seen whether the market can deliver a new high without breaking the recent low first. 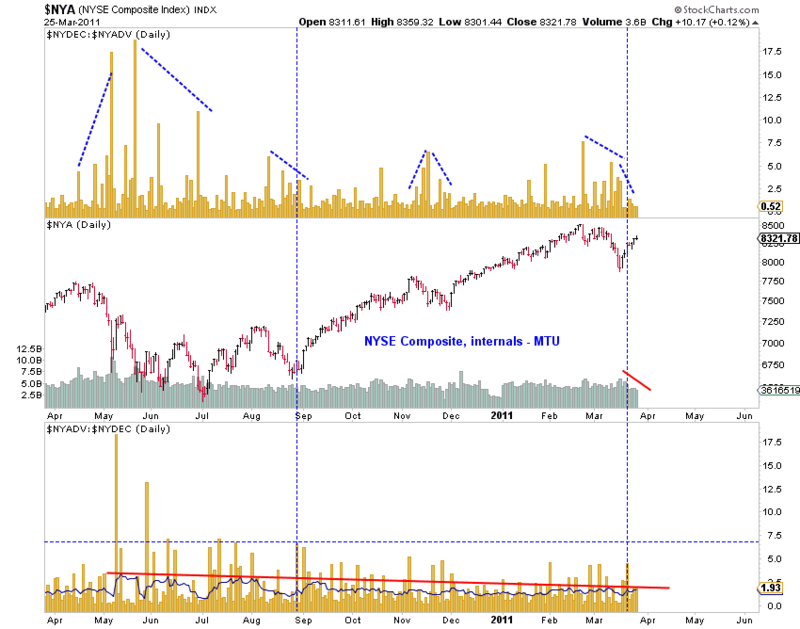 While the recovery has been impressive, it is carried out with low and declining volume and less impressive breadth (Chart 1). 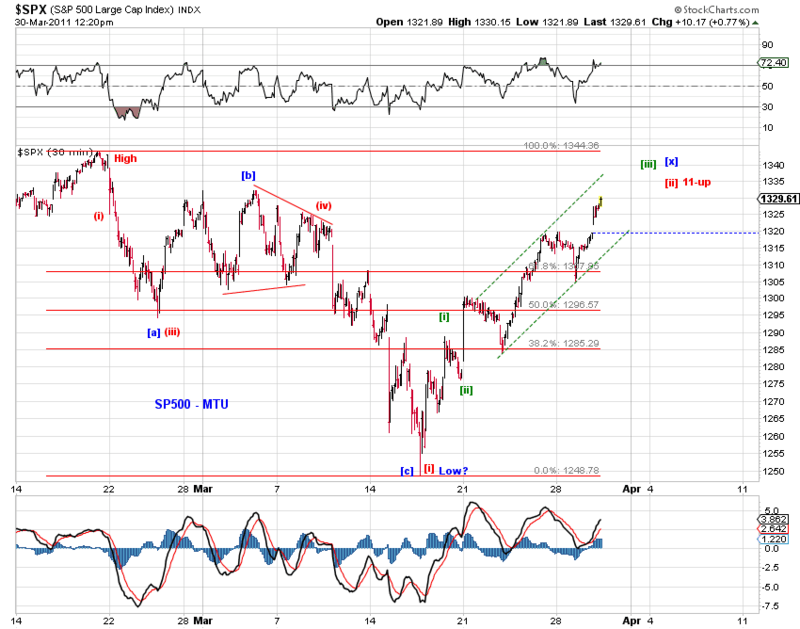 The primary bullish count is that the low of the correction was in at 1249.05 in SPX. 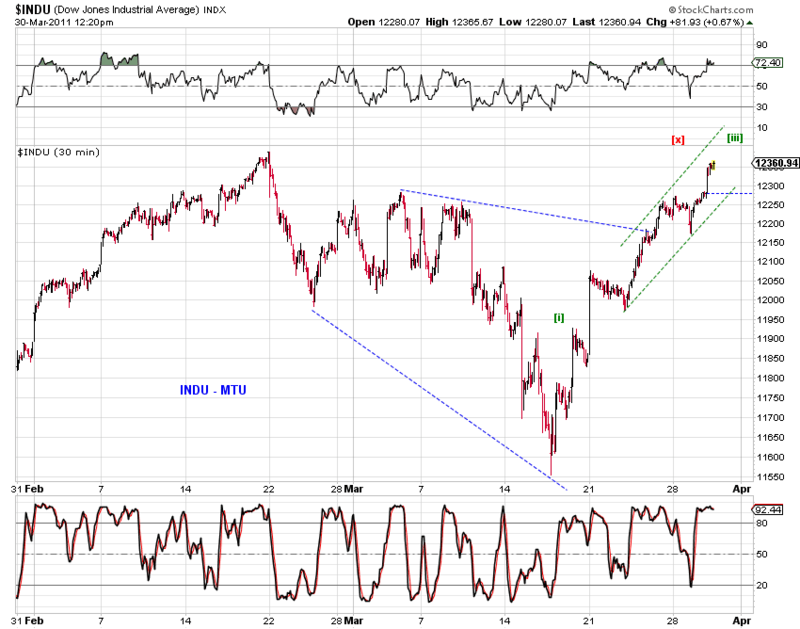 The next leg of advance to new highs is already in progress. 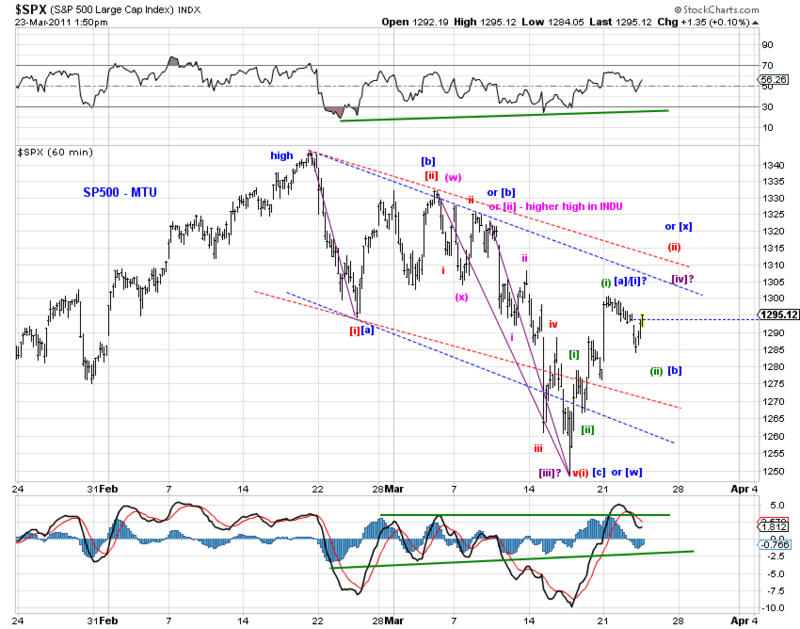 Please see the associated squiggle count on futures in the appendix. 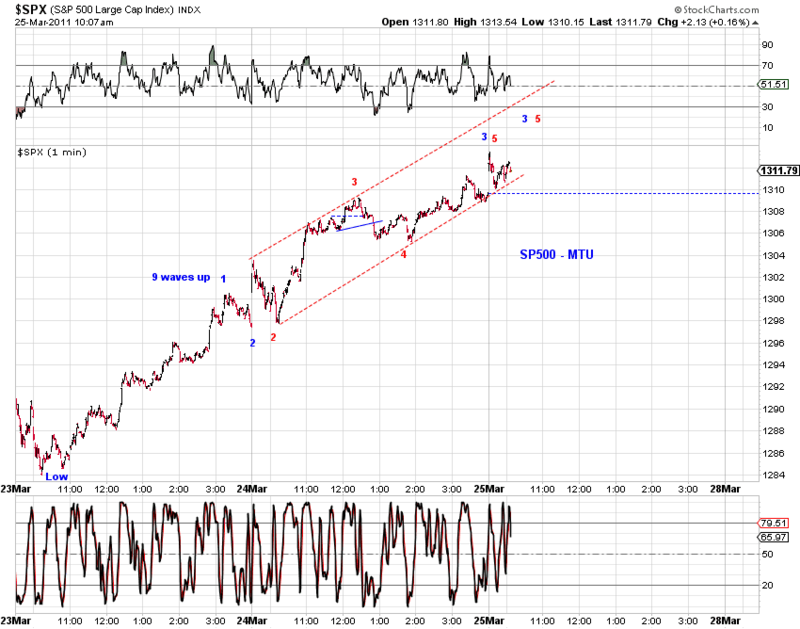 The primary bearish count is that the rebound is wave [x]-up of a larger correction. 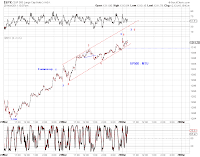 Once wave [x]-up is complete (with Friday's high as a potential candidate), wave [y]-down will either bring the market to new lows or consume time to expand the correction sideways. 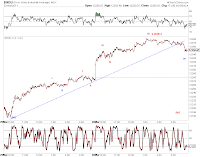 Please see the associated squiggle count on futures in the appendix. 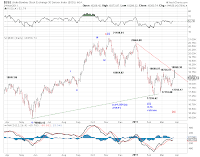 A super bearish variant of the base case bearish count is that the market has finished or is about to finish a wave [ii] retrace in the form of an upward expanded flat or a running flat across indexes, as Chart 2 on RUT illustrates. 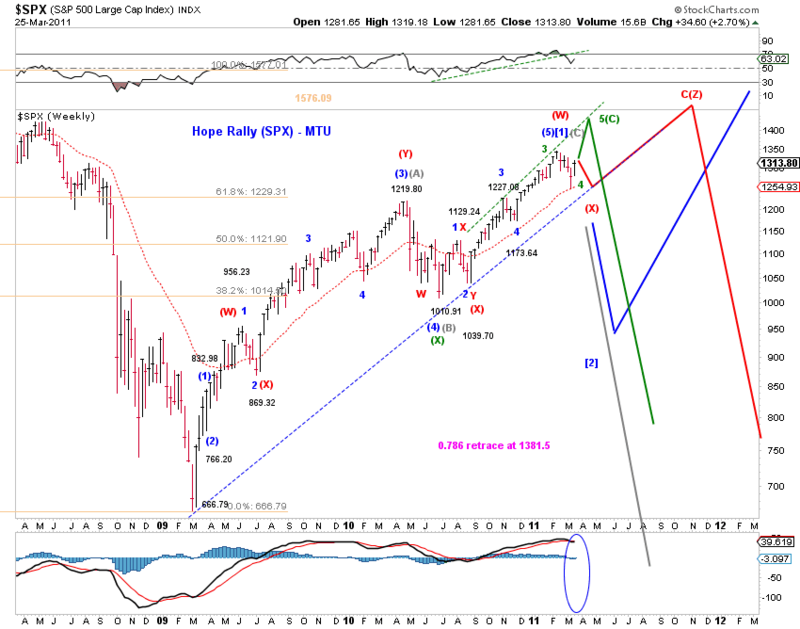 Chart 3 updates the various tracking counts on the hope rally since the 2009 bottom. The immediately bullish green count and the immediately bearish red count are the preferred tracking scenarios at the moment, given the market development. 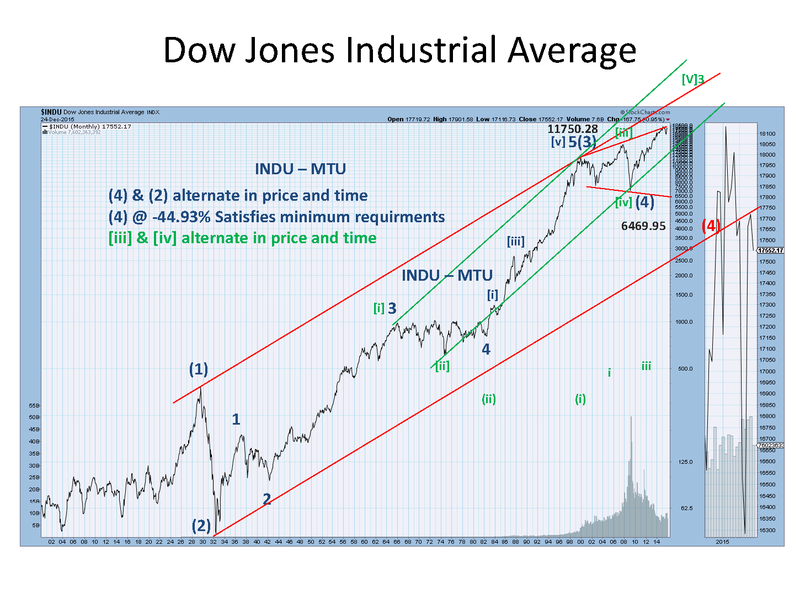 Note that the key element differentiating the green and the red counts is really whether the most recent wave (X) ended in June or in August of 2010. 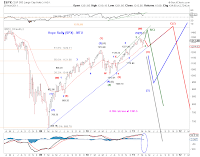 Please see a detailed discussion regarding this issue in Counting the QE2 Rally section of Bull market, B-wave and Beyond (2/18/11). 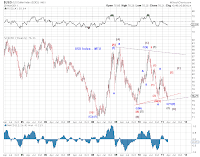 The whither the dollar section of Bull market, B-wave and Beyond (2/18/11) stated that "the primary count on the dollar is bearish for the intermediate term." The USD index has declined 3.11% since then to its recent low, but rebounded smartly this week as sentiment had reached very low levels. 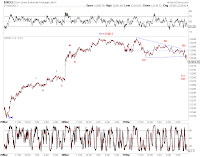 (1) the end of a contracting diagonal triangle for the near term (Chart 4). 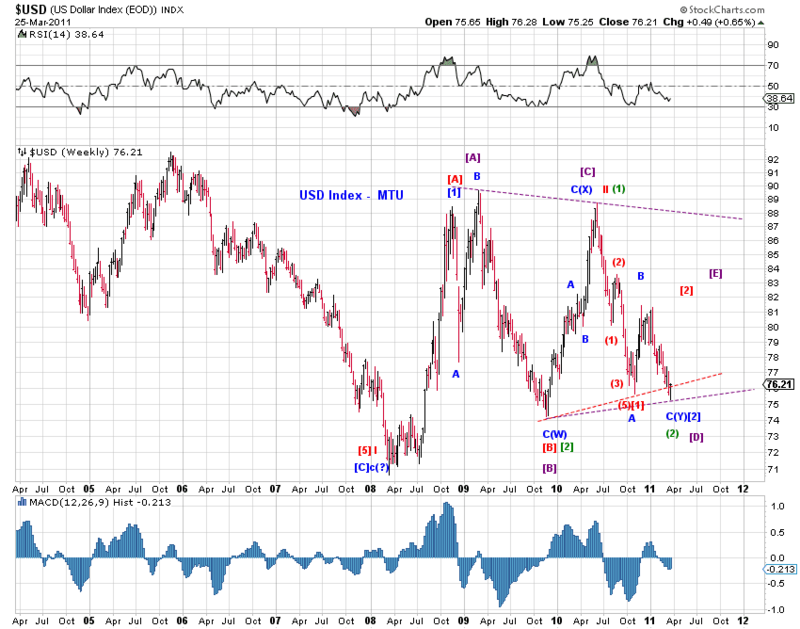 (4) the end of wave [D] of a bearish contracting triangle (Chart 5, purple). 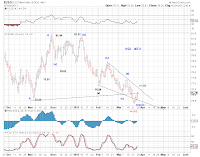 The alternative near term count (Chart 4, red) allows for one more A-B-C probe to lower lows to complete the wedge in the USD index. But the message regarding the larger picture remains the same. 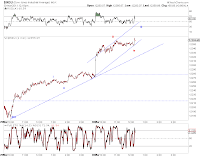 US: primary counts are an [x]/[b] wave rebound or an impulse wave advance to new highs. 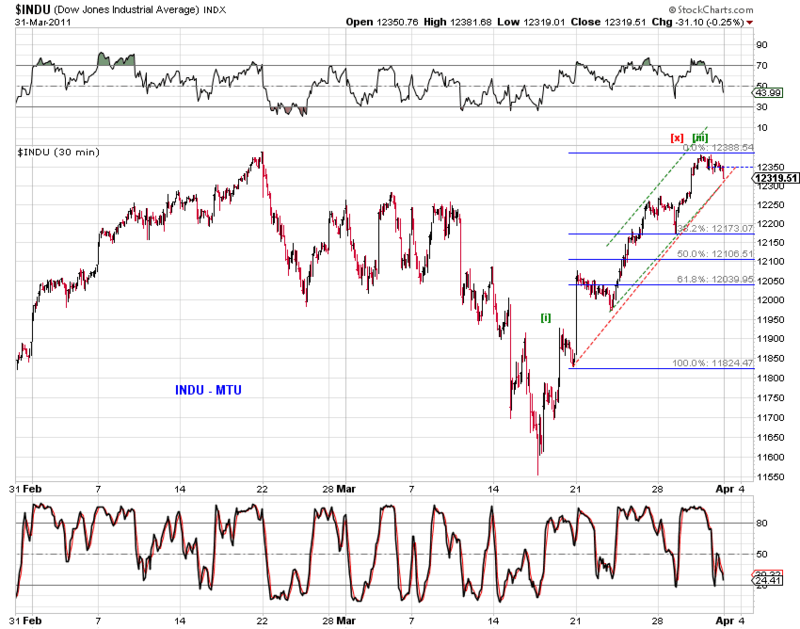 It has been a catch-up day for the high beta indexes. 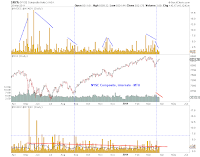 Now we have w1/w4 overlap across domestic indexes, and so has the London FTSE100. This has increased the odds, but delivers no confirmation, that the recent sell-off is corrective. 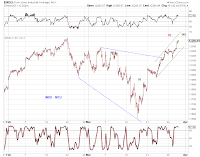 The bearish expanding leading diagonal down and the [i]/[ii]/(i)/(ii) setup are still on the table but are of lower likelihood. 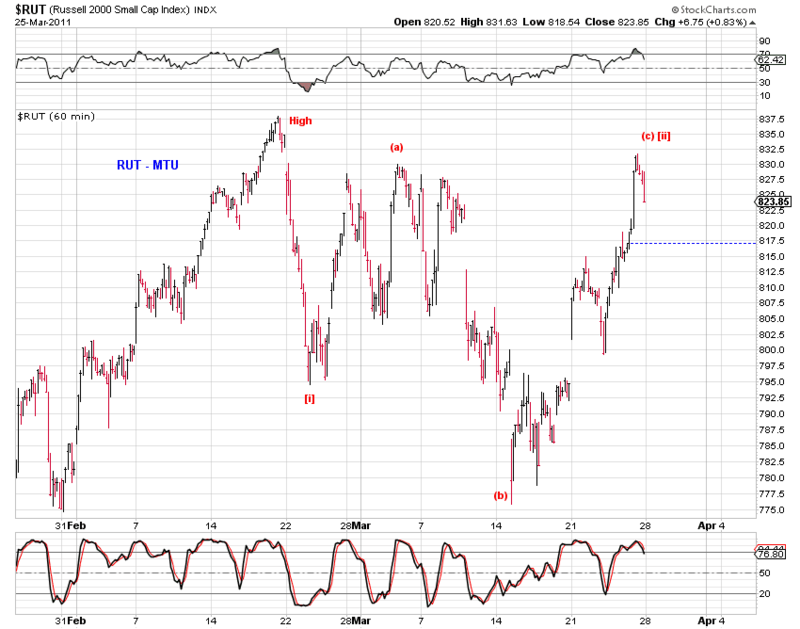 Odds appear to favor a complex correction or an advance to new highs. 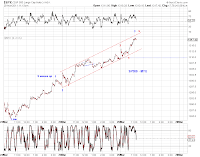 That said, a pullback is likely. 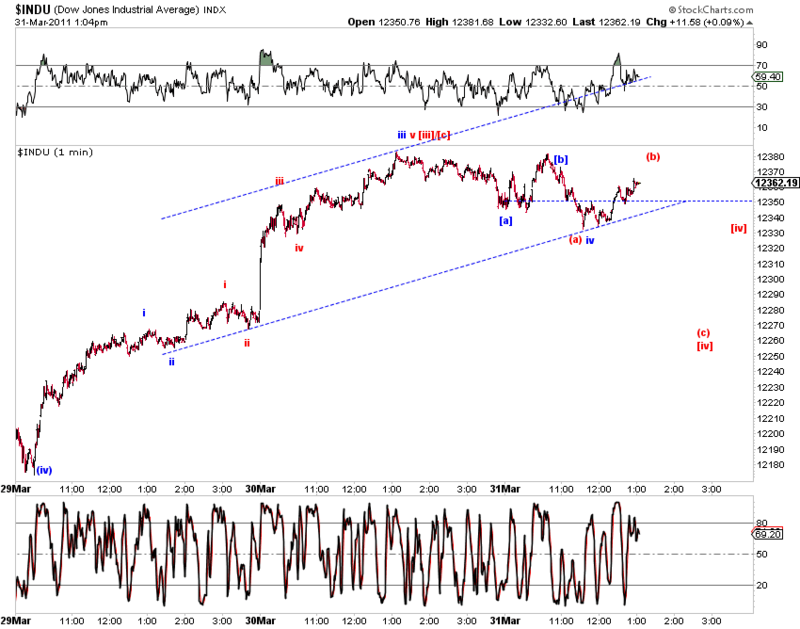 It's possible that the current high is the end of wave [x]-up or wave [i]-up, as illustrated by the squiggle count on the Dow futures. 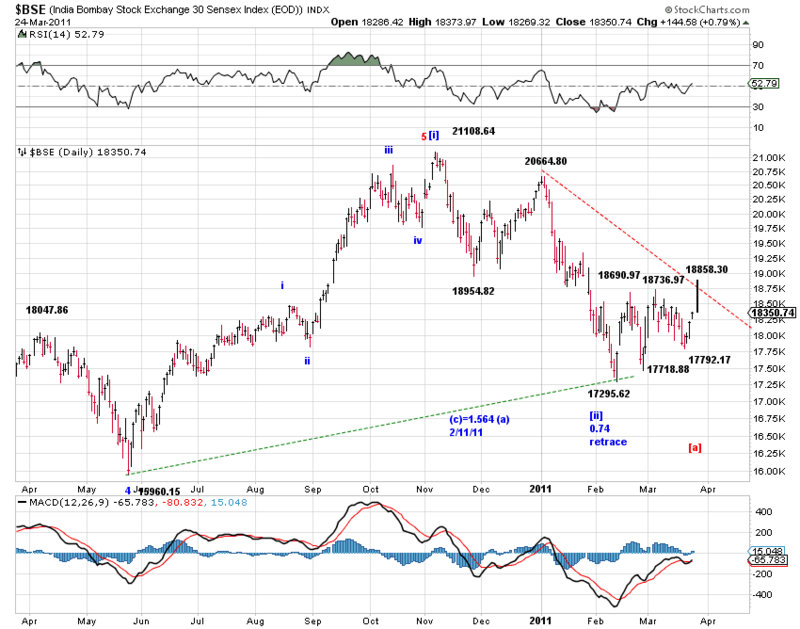 London FTSE100 index delivered an overlap of a potential w1/w4 set up. 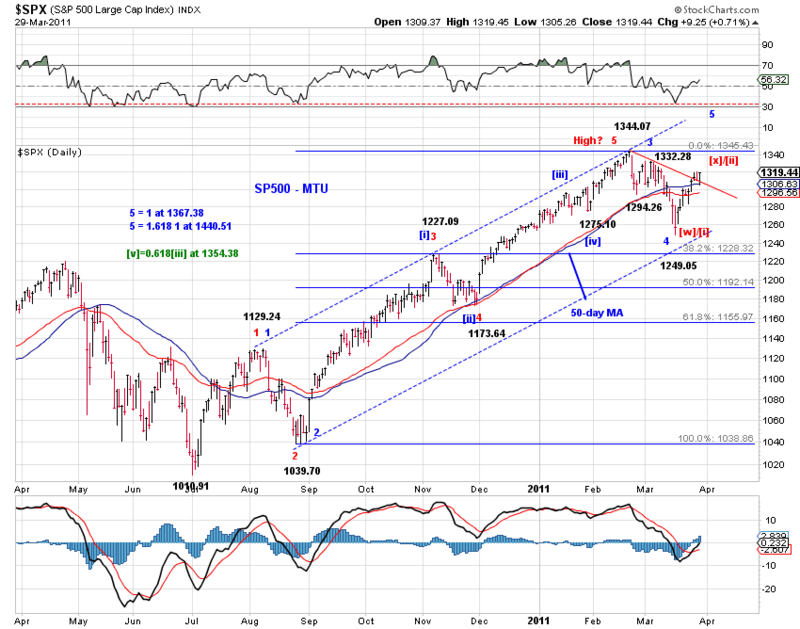 German DAX is about 2.5% away from doing so. 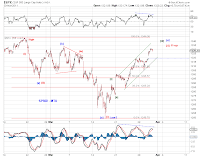 Similar overlap is now seen in SPX, INDU, NDX and RUT futures. 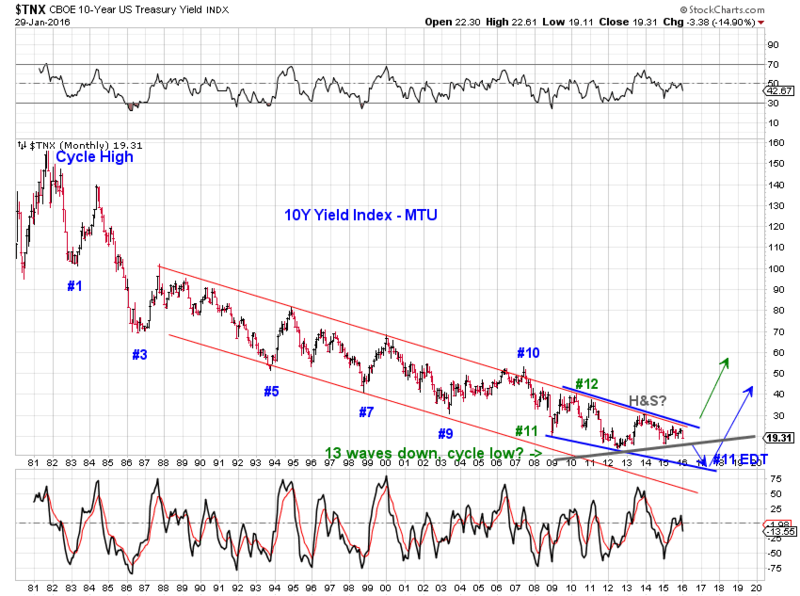 On the potentially bearish side, is that a small degree triangle overnight? SPX and INDU both closed above their respective EMA50, with INDU also above its SMA50. There's no overbought readings on a daily basis yet. MACDon INDU about to cross up. 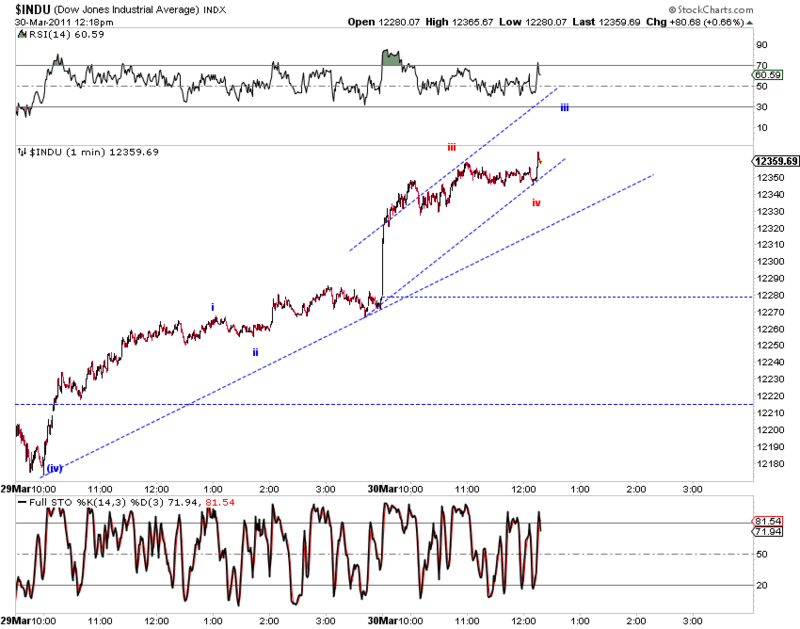 The "clearest" squiggle count remains with the Dow futures. 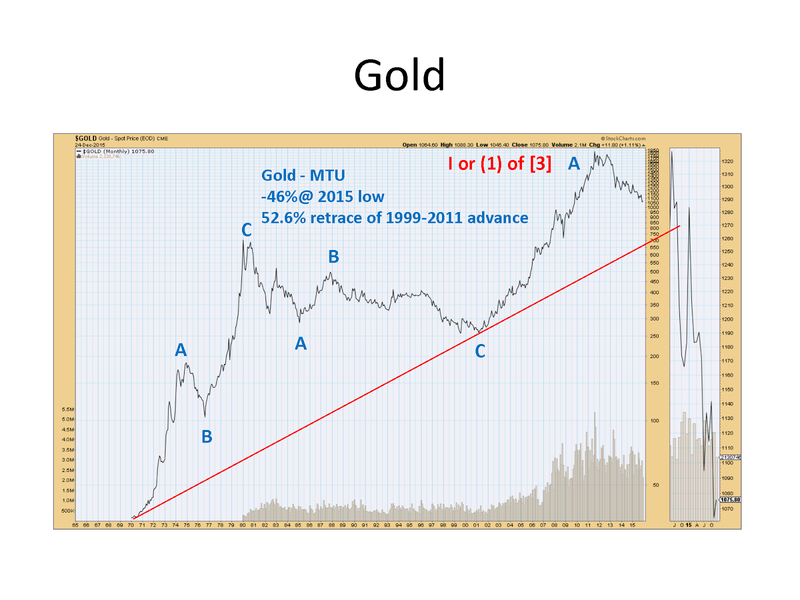 The following charts highlight my long term outlook on Stocks, Bonds, Gold, Oil and USD.